In mid-September, I headed to the Bay Area to attend the annual APLD conference, which took us to an impressive number of gardens and made me wish I could grow some of the plants I saw. Before the conference began, however, I spent a couple of days visiting my son, who has just moved to San Francisco to work. 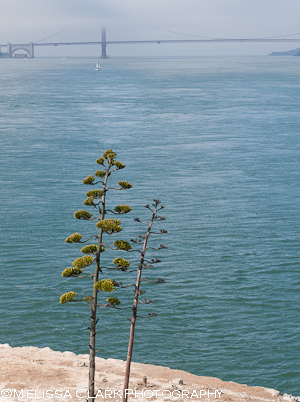 One morning, I got up early and took the ferry over to Alcatraz Island. Unlike most tourists, however, I never set foot in any of the prison buildings. 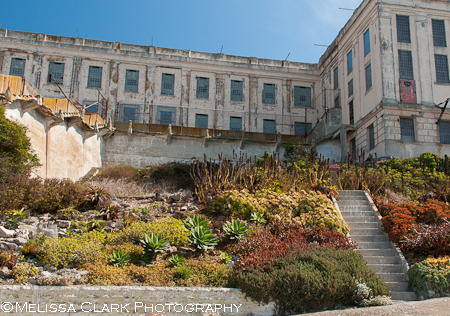 I was there to see the Gardens of Alcatraz. 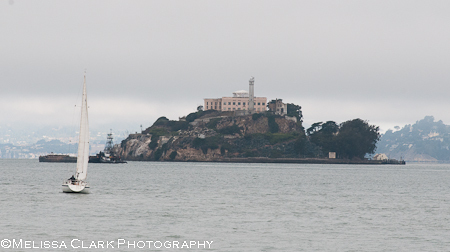 Seen from the San Francisco Bay in the early morning, Alcatraz’s appearance is more than a little foreboding. Although its nickname is “The Rock,” from early in its history, the officers’ families and later the inmates sought to soften its forbidding slopes and surfaces by planting flowers. When the Bureau of Prisons tore down two homes that had previously been occupied by these families, their foundations were converted to flower gardens tended by families and inmates. An area of the old Officers Row gardens, open to the public only through the tours offered by the Garden Conservancy two mornings a week. Another section of the gardens in the old Officers’ Row area. 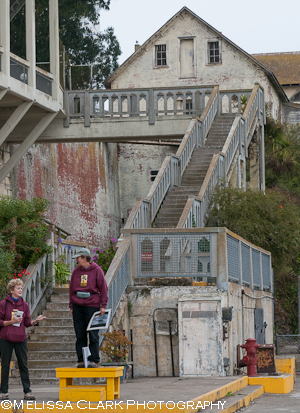 In 1986, the prison became a National Historic Landmark, but it wasn’t until 2003 that The Garden Conservancy began partnering with the National Parks Service and the Golden Gate National Parks Conservancy to clear away over 20 years’ worth of neglect of the garden areas. Today, Garden Conservancy volunteers, working through the NPS, lead fascinating and informative free tours ranging over much of the island on Friday and Sunday mornings. My two guides, both first-rate in terms of their knowledge of Alcatraz’s history as well as that of the gardens, met a group of us on the 9:10 a.m. ferry on Sunday morning and soon we were off. Monica Beary (left) and Corny Foster (right) await us. Steps to climb? There were lots. I was surprised to see plants like old roses, fuschias and geraniums (as well as succulents) in profusion. Our volunteers explained that these were “survivor” plants that had been discovered in many locations when the GC’s restoration work began. The plants introduced by the inmates and families were exotics; the climate (Sunset Zone 17) is mild and Mediterranean in nature. 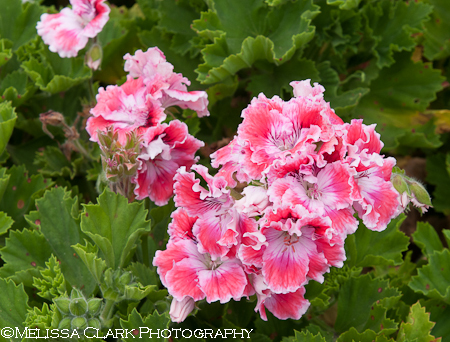 Perennial geraniums in the Officers’ Row area, near the greenhouse. 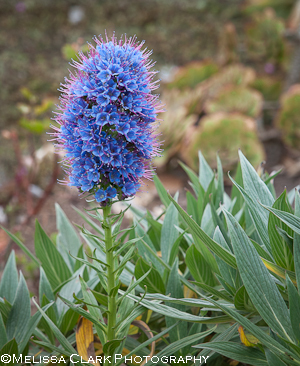 Echium candicans (Pride of Madeira), a North African native, grows in the Gardens of Alcatraz. It’s a favorite of hummingbirds. Almost everywhere, the view out to the Bay reminds visitors how isolated and grim “The Rock” would be without these gardens to soften it. Succulents and roses frame a view of the Bay. An Agave americana in flower on the edge of the island. At the end of our tour, we took in views of the west end sloped areas of the island – the only gardens that most prisoners could see. Today these areas are planted heavily in succulents interspersed with other plants, such as Gaura, which can tolerate the rocky soil and limited rainfall of the site. 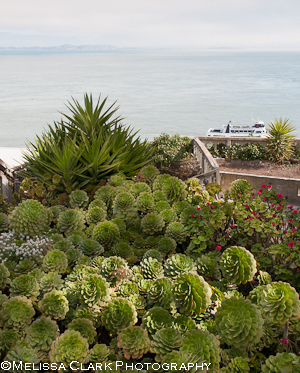 If you’re fortunate enough to visit the Bay Area over a weekend, the Garden Conservancy offers tours of the Gardens of Alcatraz on Friday and Sunday mornings at 9:30. You’ll need to book the 9:10 ferry, nothing later, if you want to get there in time. 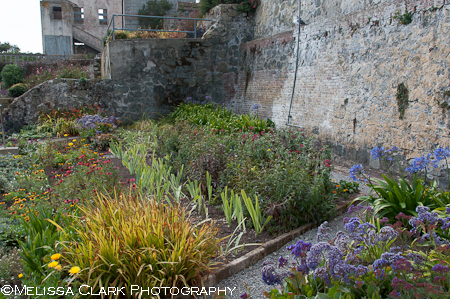 And for more information on the gardens, check out Bay Nature’s online article and the Conservancy’s own website. Highly recommended! As many of you know, I live in the metropolitan Washington DC area. One of my favorite photographic haunts is Brookside Gardens (part of the Montgomery County park system). 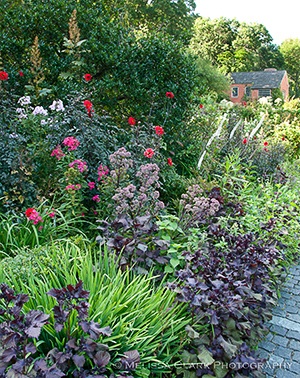 This year they have organized a tour of seven private gardens in Bethesda, Maryland for Saturday June 2nd. I’m very impressed how quickly they’ve been able to organize it, find gardens, and arrange publicity. (I worked on the local Garden Conservancy Open Days Tours here in 2010 and it was a lot of work!). 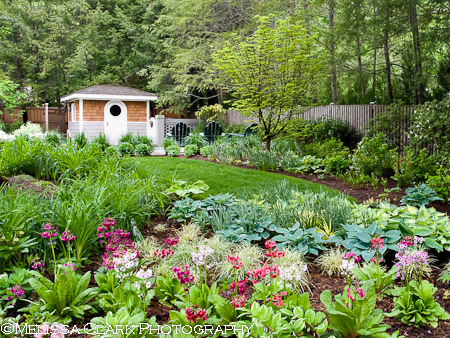 Originally designed for a client of hers, this garden came into Barbara’s own possession when the client moved to Boston. She makes changes every year. I love visiting and photographing it because of the amazing plant combinations she has come up with, not to mention her containers. 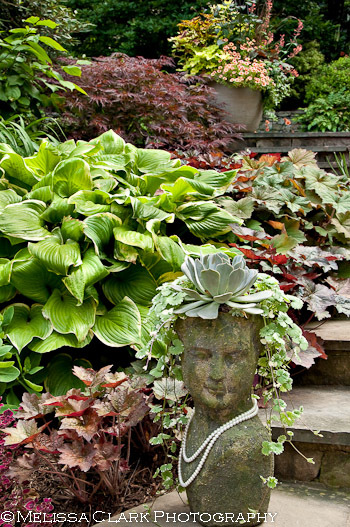 A bust with pearls, planted with ivy “hair,” provides whimsy and textural contrast in the spring garden of Barbara Katz. 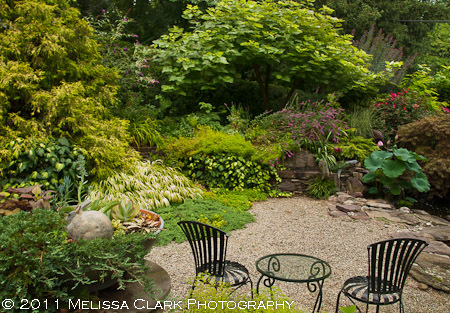 The other garden on the tour which I know well is – full disclosure – one I designed in 2003, and which I continue to work on with its owners, Robyn and Bill Collins. Because the house sits on an underground spring, the site is consistently wet and one of the issues we had to address (and still struggle with today) is moisture. This is true especially in the back garden, which may be why these astilbes look so happy, and hostas thrive. 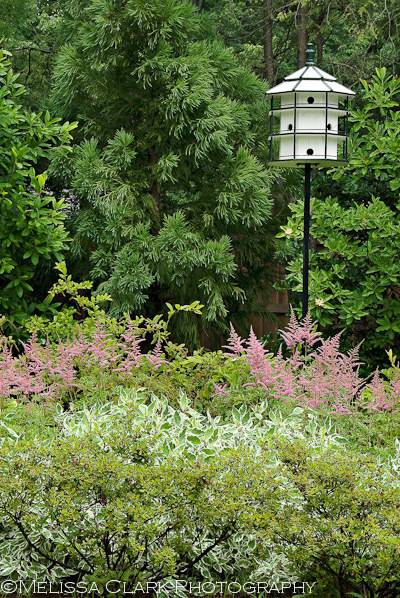 Astilbe, Cornus alba ‘Ivory Halo’, and sweetbay magnolia in the back yard of the Collins garden. Although the primulas aren’t likely to be in bloom by the time of the tour, the hostas and other shade plants shown in this photo will be in full glory. A view of the pool house from the patio in late spring. Other gardens on the tour include the personal garden of Holly Shimizu (director of the US Botanic Garden) and three other gardens personally selected by the staff at Brookside. 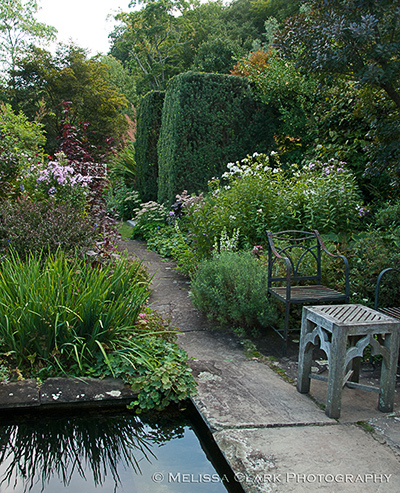 For more details and photographs of the gardens, click here. 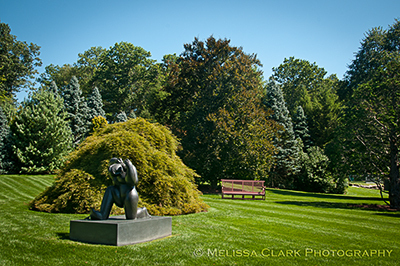 You can register for the tour in advance here or by coming to McCrillis Gardens in Bethesda on the morning of June 2nd, where on-site tickets will be sold and addresses for the gardens will be available. This is a fundraiser for one of our area’s premiere public gardens. If you’re within driving distance, please mark your calendar! This is a rain or shine event. You may even run into me at the Collins garden, where I expect to be on hand to answer questions most of the day. 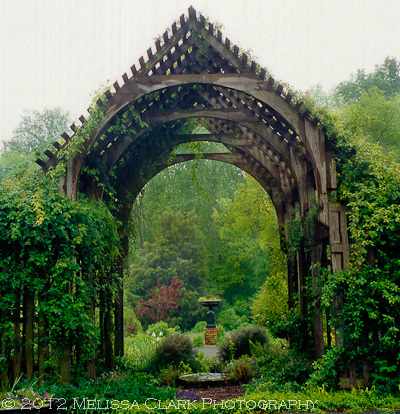 One of the first famous gardens I visited after becoming a gardener myself was Montrose Garden, in Hillsborough, North Carolina. It was part of a weekend trip that included a visit to the J.C. Raulston Arboretum, Edith Eddleman’s own garden, and tantalizing stops at places like Tony Avent’s famed retail mail-order nursey, Plant Delights. 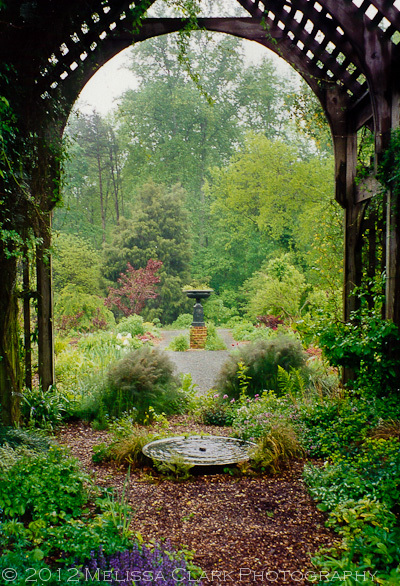 Montrose is a 61-acre property that was purchased in 1977 by Nancy and Craufurd Goodwin, who immediately began to expand the gardens substantially. Neophyte that I was, I had no idea of how well-known or superb Montrose was when I first stepped off the bus that morning. Nancy Goodwin herself, along with an intern who was working at the garden for the summer, greeted us and showed us around. I saw Dianthus planted in gravel for the first time, was awed by a mature baldcypress tree that had been grown from seed (planted by the previous owner), and ended up at some long tables back behind the house that represented the winding-down of Goodwin’s own mail-order nursery efforts, where we bought some small plants to bring home. Goodwin spoke about how there is always something blooming, the thousands of snowdrops that have naturalized from the hundreds she planted, and then turned us loose for a little while to wander on our own. I wasn’t really a photographer at the time, but I did have a camera along, and captured a couple of shots of the Lathe House, which I’m sharing today. I was inspired to write this post because of an article in the New York Times I came across in digital form the other day, testifying that the garden is still going and open to the public by appointment. Goodwin and her husband have made provision for it to become a preservation project of The Garden Conservancy. If you have a chance to visit, don’t pass it up. If you want to learn more about Goodwin and the creation of the garden, she has written two books, both of which I can recommend: Montrose: Life in a Garden, and A Year in Our Gardens: Letters By Nancy Goodwin and Allen Lacy. to sitting in the garden. I’ve been working on a couple of garden designs recently that seem to call out for a space for a bench. It’s made me think of some of the gardens I have created, or visited, that include a space for sitting. As Osler’s quotation shows, benches aren’t always for sitting. 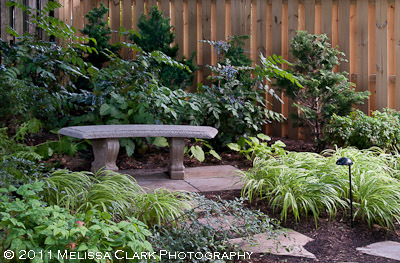 Sometimes a bench is really just a “focal point,” giving a garden room or area a place to draw the visitor’s eye. Other times, the garden owner, or someone visiting them, will actually use it. Take my own front yard bench, for example. My older son often liked to sit in this this bench under the crabapple tree in our front yard during high school, studying or reading. A small 4' bench nestles under the crabapple tree in my front yard in summer. 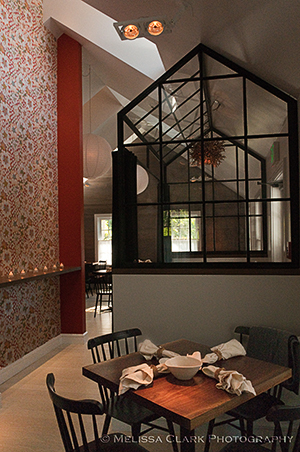 But I really included it in the design as a visual focal point – and I hardly ever use it. It’s most visible – and striking – in the winter, I think. 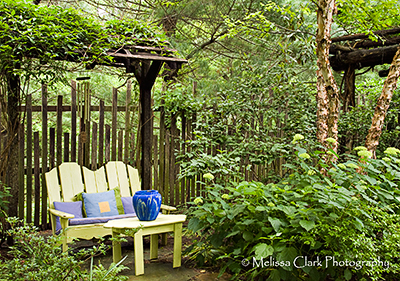 A bench can be painted to provide some zip in a garden”room,” like this small yellow two-seater in Gay Barclay’s garden in Potomac. This bench looks inviting and as though it’s used often. 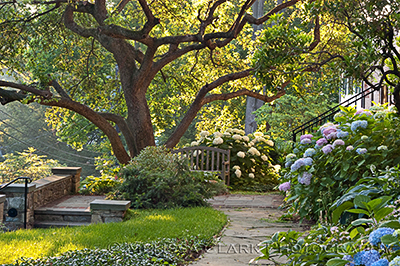 A small seating area in a private garden welcomes visitors on an Open Days tour in Potomac, MD. 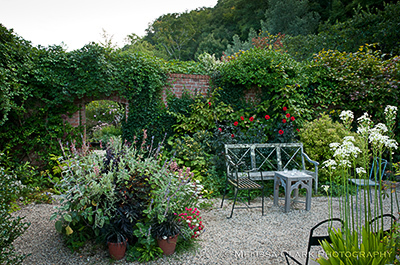 In a more formal garden, a bench against a wall with climbing plants provides structure. But take a look at the bench below, which although lovely, has no path leading to it other than grass in front of it. How often do you think garden visitors sit here? But without it, the effect would be completely different. 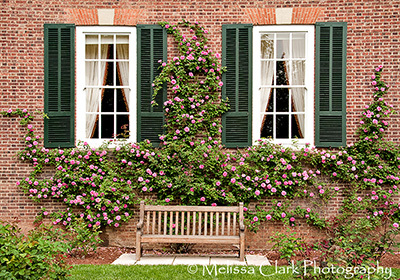 A climbing rose above a teak bench adorns the wall of the British Ambassador's residence in Washington DC. Doesn’t this small seating area with a teak bench look more inviting? 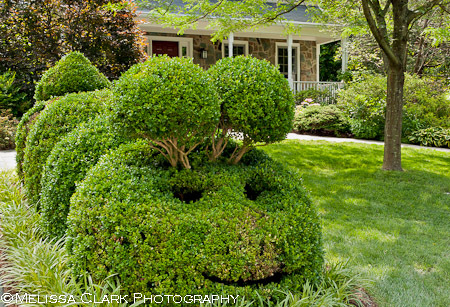 It’s in the front yard of a garden in Cleveland Park, designed by Lynne Church. I could definitely cozy up with a book here. 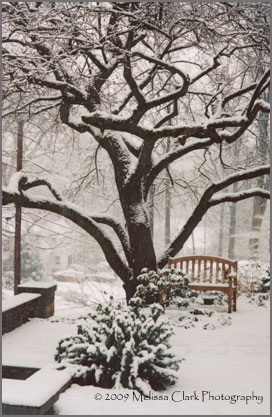 A small seating area with teak bench under an old cherry tree, in a garden designed by Lynne Church. All these benches are wooden, but you don’t have to limit yourself to that material alone. Here’s a stone bench from the same garden, under a large tree in the back yard. It seems to blend in more naturally with its surroundings than teak, at least to my eye. 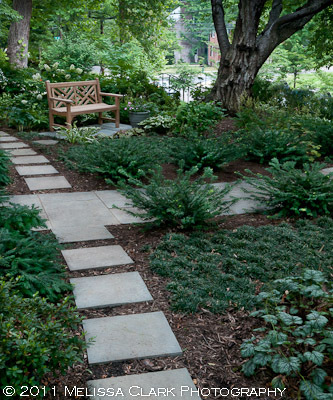 A curved stone bench lets the plantings behind it shine through. 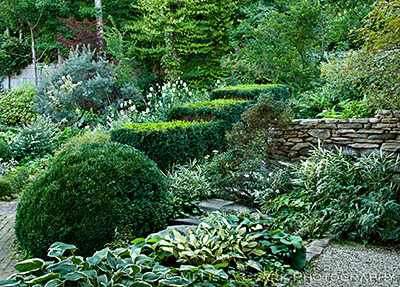 Finally, here’s Corinna Posner’s garden, from the Garden Conservancy Open Days tour here last year. Note the stone bench area built into the retaining wall – as well as bistro seating in the foreground. Two seating areas, separated by a gravel area, in Corinna Posner's garden. The "built" bench is just barely visible across the gravel space, in the retaining wall under the coppiced Catalpa tree. The possibilities are endless, and you don’t need a large space. So if you’re planning changes to your garden, think about the value a bench – or other seating area – can add, for the eye, the visitor, and the gardener. A view from the Apple Tree Terrace out over the Walled Garden at Hollister House. 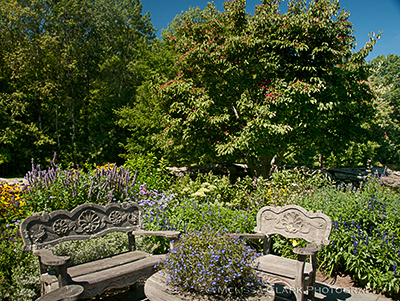 During my weekend in Connecticut, touring private gardens open in Litchfield County through the Garden Conservancy, I spent an afternoon at Hollister House Garden in Washington, CT. I planned this part of my trip to take advantage of the fact that on the Saturday of that weekend, this garden was open from 3 to 6 pm, which I hoped would afford me more opportunities to have good light for photographing it. Hollister House was begun in 1979 by its present owner, George Schoellkopf, and is sited on 25 acres of fields and partially wooded landscape. Most of the garden rooms – for this is a property that has many such areas – radiate out from a rambling but appealing 18th century farmhouse building and its surrounding outbuildings. “Romantic” is a good word to describe the feeling of this garden. 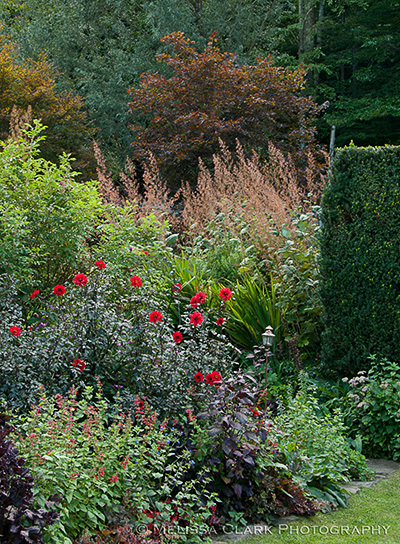 As in some of the famous English gardens (Sissinghurst, Hidcote, and Great Dixter come to mind), there is a deliberate combination of formal structure and lush, informal plantings. Paths and openings in high hedges and brick walls lead the visitor’s eye and invite you to explore. There is even a “Gray Garden” close to the house, which mixes whites, grays and cool blue tones around a boxwood-structured space. 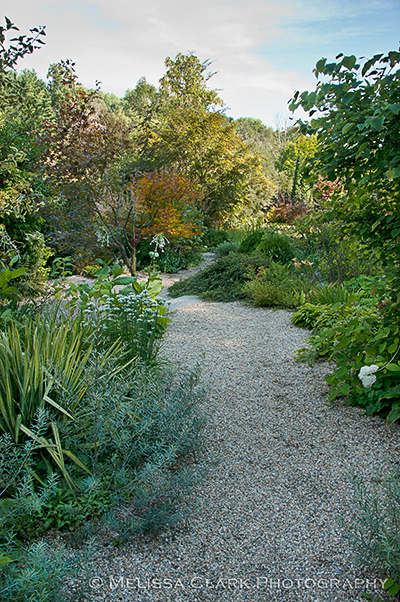 Gravel paths were everywhere, easy on the feet and the eye, and providing a medium into which a surprising number of plants had seeded themselves successfully. A gravel path along the Brook Walk as the light fades at the end of the day. 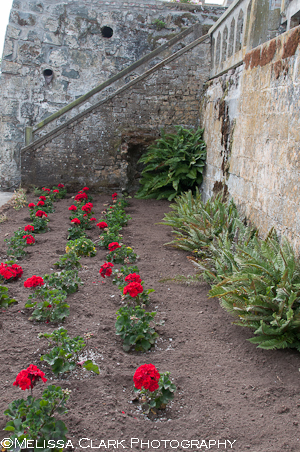 A small seating area near the Garden House, on the other side of the Walled Garden, with dahlias in bloom behind a bench and overflowing pots. The gravel-based "Blueberry Plantation" area of the garden, planted with vegetables and sporting a large blue-hued metal container as a focal point. I’ll end this post – as I began it – with one of my favorite shots: a partial view of the reflecting pool in the Walled Garden. A small seating area in the Walled Garden, with the reflecting pool to the left. Hollister House Garden is now owned jointly by Mr. Schoellkopf and a non-profit organization he has founded that is dedicated to the preservation of the garden and the house for the public’s enjoyment and education. 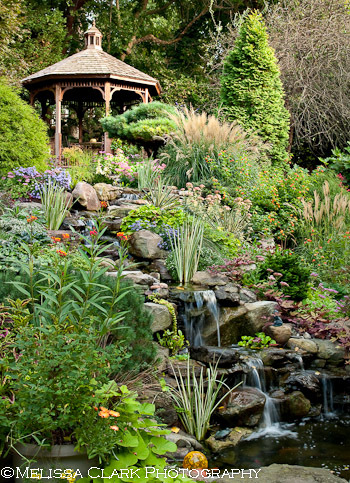 It is a project of the Garden Conservancy, and the Board of Directors includes, among others, author Page Dickey and Marco Polo Stufano, former director of horticulture at Wave Hill. This is a garden not to be missed, and I hope to return again soon. For those of you who might be in New England during gardening season, Hollister House holds visiting hours every Saturday from May through September, and offers group visits by appointment. Check its website for details. On the morning of the last weekend of August, my two sons headed West to explore the Grand Canyon on a raft. Not to be outdone, I headed East (well, north, from my perspective) to explore some gardens. By now many of you know my propensity to head for new gardens, camera in hand, when I have time. 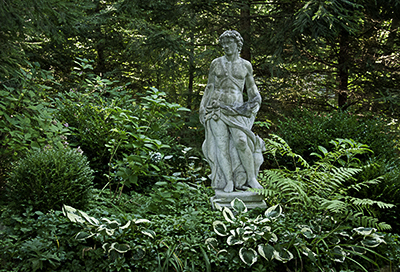 On this occasion, feeling somewhat burned out on the design side and weary of heat-stroke-high temperatures in the Washington area, I decided to spend the weekend in central Connecticut, visiting some of the private gardens open on the Garden Conservancy’s Open Days tours. On Sunday, August 29th, I managed to make it to all but one of the gardens on the tour. For the most part, they were quite different in size, design aesthetic, and age. Two of them were long-established, owner-designed gardens that made me feel quite at home, despite being much larger than my own. First was the Copeland garden, where the owner greeted me at the entrance and told me about the twenty-plus years he has been working on the house and garden. 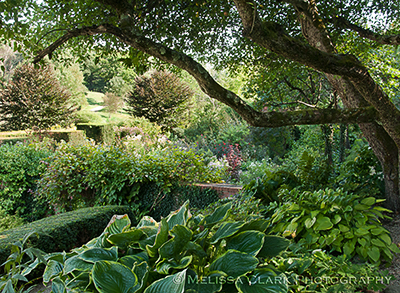 Although the main “room” where I began my tour was full of boxwoods, roses, and dahlias, my favorite scene came in the woodland garden just beyond the already-beating sun. 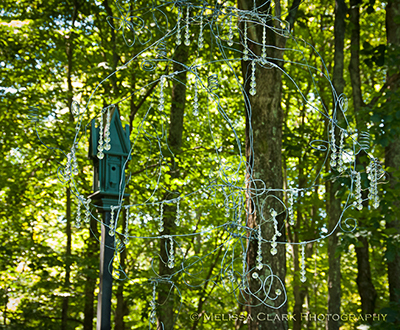 Although sometimes I find classical statuary in the garden badly placed, here it was perfectly situated. 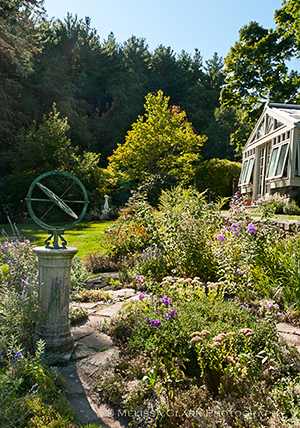 The garden of Martine and Richard Copeland has "rooms" of both sun and shade. Bookending the day was a garden in Washington, CT, just down the road from Hollister House (which I’ll get to in another post). Georgia Middlebrook has lived at Sprain Brook Farm, which dates back to 1750, for 45 years. The 36-acre landscape, which includes a pond and other water ways, bridges, a very shady garden, herbaceous borders near the house, and a lovely shaded terrace. Late-season bloomers up near the greenhouse and terrace included phlox, lab-lab, rudbeckia, and annuals. In between, I visited three more gardens (whew). Number two on the itinerary was the estate of Mrs. Michael Weiner, also in Roxbury. 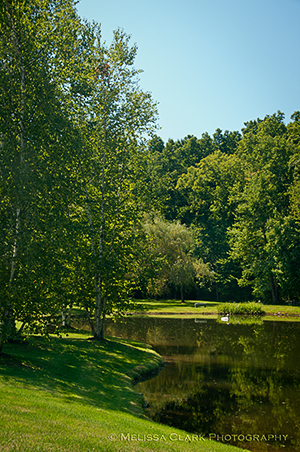 This property, which consists of 300 acres (sixty of which are planted), has been developed over a period of twenty years under the guidance of Tommy Verderosa, who ferried some of us back and forth between the parking area and the front door. I stole a few minutes of his time on the ride to the house; he explained that almost all of the mature trees on site have come from other parts of New England, planted as sizeable specimens to begin with. The gardens in front of the house included a large man-made lake and waterfall and many areas where large sculptures drew the visitor’s eye. This sculpture reminded me of Brancusi although I could find no artist's signature. In the rear garden, on a grassy lawn below a terrace overlooking a stunning mountain view, was another large sculpture, this one by Alan Shayne, whose garden I was to visit later. 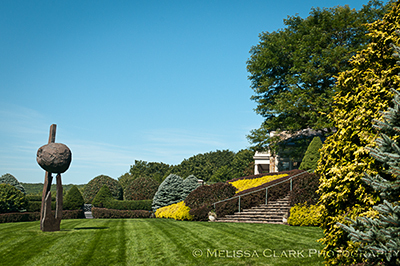 An enormous apple sculpture by Alan Shayne on the back lawn at the Wiener garden. As this photo suggests, carefully pruned conifers and other evergreens in contrasting colors are the building blocks of many parts of the Wiener garden. 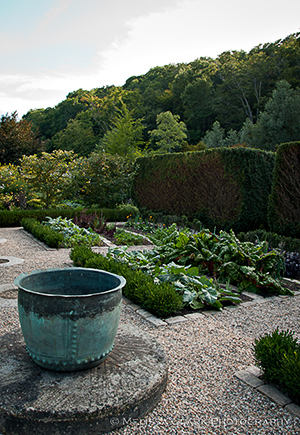 I left with my head spinning from the chartreuse, blue and green tones and the scale of it all (Mr. Verderosa said that in addition to himself, a staff of five or six gardeners works full time five days a week during the growing season to keep the garden looking its best). My next stop was the garden of Norman Sunshine and Alan Shayne, in Washington Depot. The Open Days Directory describes the garden as “a large, meticulously maintained country garden in a pastoral setting of fields and ponds with rolling hills in the distance.” As my British friend Jill would say, “spot on.” By now it was noon-ish and I was cursing the blazing sun (not to mention the unusually high temperatures for the region), but these images should give you an idea of the place, which I loved. The owners designed it themselves, and they have struck the right balance in providing interest around the house without competing with the simple but spectacular views beyond it. I appreciated the swan posing so patiently on the pond. 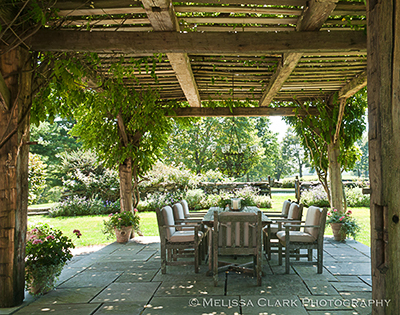 A wisteria-shaded arbor provides the perfect view out past a perennial border and the pool to the low stone walls and pastureland beyond. An old-fashioned cottage garden is the first thing to greet arriving visitors at the Sunshine-Shayne garden. 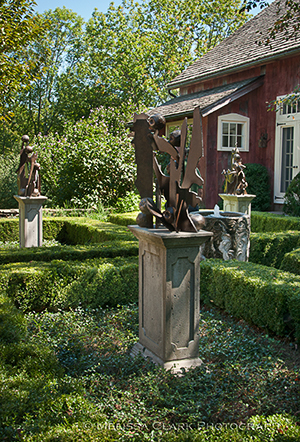 A small sculpture garden displaying some of Alan Shayne's work is tucked away behind the main wing of the house. Next stop was “Muddy Rugs,” another Washington Depot garden “welcoming new gardeners.” The owner, who works in interior design in New York City, has designed this relatively new garden himself and divides his time between this, his country house, and life in the city. Like the Sunshine/Shayne garden, this property is surrounded by a large stretch of open lawn, but the view is closed in by a line of large mature trees which provide screening from neighbors’ properties on one side and places to explore on the other. 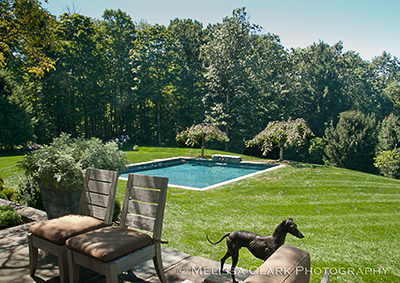 The view from the back terrace at Muddy Rugs, down to a pool with two weeping cherries and the woods beyond. In the woods behind the house, just short of a low stone wall, I discovered a small bistro table with two metal chairs. Suspended above it was an extraordinary-looking “chandelier,” which in the evening can hold candles and flowers for outdoor drinks or dinner. Muddy Rugs also has a “sculpture garden” in front of the house, with boxwood, groundcovers and perennials. Kudos to the owner for giving us so much to look at and starting such a promising garden! Plans are being made to develop a walking path on the hill above the house as well as a woodland garden near the “chandelier” area. Coda: At the end of a long, lunch-less day (unlike some of the other resourceful visitors I saw, I hadn’t thought to pack a sandwich), I opted for a very early dinner at a new restaurant in Washington (? the mailing address is apparently New Preston – whatever) called Community Table. The Community Table restaurant on Litchfield Turnpike doesn't take reservations, but it makes a mean gazpacho. All its food is locally sourced, the ambience is lovely, and the most unusual feature of the place is a 300-year old “communal table” carved from a walnut tree (I think). 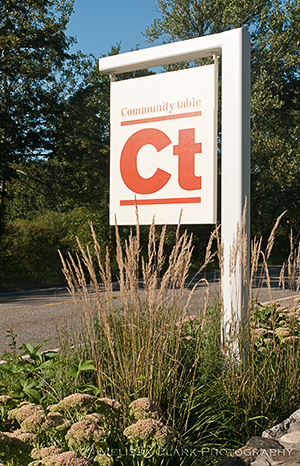 Come early for your choice of tables at the Community Table restaurant. I had a gazpacho so delicious I had to restrain myself from licking the bowl. CT plans to remain open through the fall and most of the winter – they are canning and preserving fresh fruits and vegetables from local farms. Rumor has it that they plan to close only for the month of February. Don’t miss this if you’re in the neighborhood!